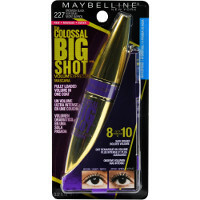 Unleash girl boss lashes with Colossal Big Shot, for fully loaded volume in one coat. 8 out of 10 saw bigger bolder volume. The Big Shot brush features unique, wavy bristles that cradle lashes, while the collagen formula delivers bold volume. Ophthalmologist tested. Suitable for contact lens wearers. Love the Mascara. It says on well and covers each lash each lash while elongating each lash.